It’s one o’clock in the morning in a dimly lit basement beneath an office block on Hackney Road and the rhythmic wailing of the building’s fire alarm is discordantly mingling with the flickering drums and grinding bass of Ed Rush and Optical’s 1998 dark drum and bass classic, 'Alien Girl'. At the edge of the crowd that has started to mass in front of a sprawling soundsystem, cigarette smoke is mingling with paint fumes as a punk girl wearing a black tutu rapidly spray paints on one of the basement walls. As the siren blares out a raver carrying a torch and wearing a camouflage jacket walks methodically through the tangle of people on the dancefloor, stopping at certain points to gaffer-tape black bin sacks over the smoke detectors that are dotted across the low ceiling of the basement. Seconds after the final smoke detector is taped up the alarm abruptly cuts out, leaving the bass to swirl through the smoke and paint fumes uninterrupted. Tonight, this empty four-storey building has been taken over by some of London’s most active free party soundsystems, becoming a frontline in the city’s war on, what the police call, “unlicensed music events”. Over the last decade, as licensing requirements in the capital have become more onerous and the number of legitimate nightclubs in London has halved, illegal raves have seen a renaissance. The number of unlicensed parties in London nearly doubled between 2016 and 2017, according to data collected by SCO-36, a Metropolitan Police intelligence unit. As illegal raves have proliferated, the Met has increasingly associated them with public order and drug offences and allocated more resources to prevent them from happening. 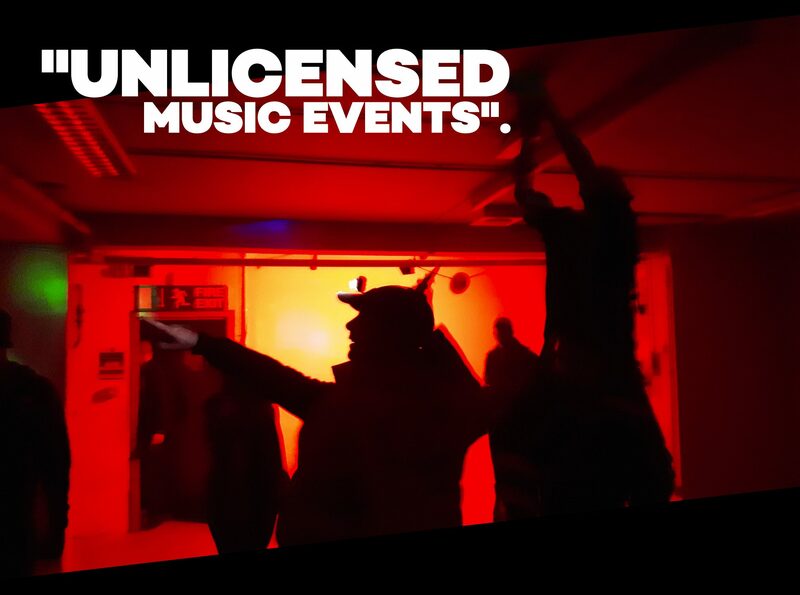 In March, the Metropolitan Police released a statement saying it had “renewed” its focus on unlicensed music events over recent years “following the deaths of young people and serious disorder”. This followed statements from Detective Chief Inspector John Oldham, the Head of Crime at the Met’s Public Order Command, who said his police force had changed its tactics regarding unlicensed music events in 2015, and started to prioritise the surveillance of suspected organisers. 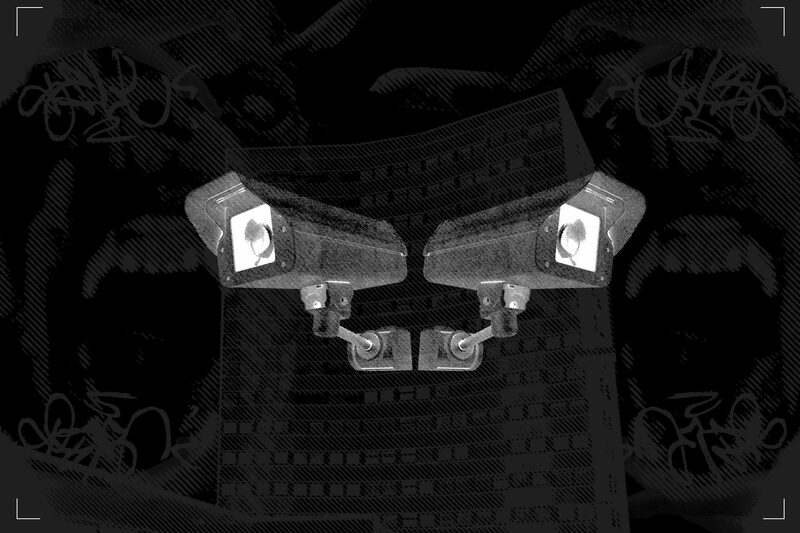 Covert tools now used by the Met’s Public Order Command include online monitoring and the use of intelligence collection officers that are sent into venues. Speaking in January, Oldham said he expected that the ongoing crackdown would lead to a significant decline in illegal raves over 2018. “I think that we’re at the cusp of having a drastic effect on them in terms of turning the corner and making the numbers go down,” he said. But, so far, this hasn’t happened. About an hour after the location of the party is released, the trickle of people pouring in through the gap in the gate turns into a flood. On Hackney Road, small groups assemble in the streets and lock bicycles to railings before following the sound of thumping bass down a back street and, eventually, through a gap in some chained gates into the building’s car park. Inside the yard a group of people are milling around next to a loading bay – chatting and smoking cigarettes. Others form part of a rapidly expanding queue to the building’s narrow doorway. One girl in a black and white checked dress is wearing a plastic tiara in honour of the royal wedding, which concluded just 12 hours before and saw film stars and aristocracy pile into an ancient building where they listened to Bach, Schubert, and Fauré. At the door a fiver is handed over and pink permanent marker is scribbled onto each person’s hand as they enter. Within minutes, the cold, empty office block becomes a sweaty pit – with a gridlocked throng of revellers clutching balloons crushing into the staircase that leads to the basement. The crowd ranges from shell suit-wearing full-time squatters with asymmetrical haircuts to bearded accountants and dreadlocked virtual reality tech entrepreneurs. Ancient, mohawked speed freaks mingle with vegans in hemp robes. There are men wearing hoop earrings and gold-trimmed sportswear. Anarchists, hippies, transvestites, and young, spray can-toting teenagers. All are united by one thing: the desire to party without being constrained by the rules laid down by a club, a licensing body, or the law. As the building starts to fill up with people and the party moves up a gear, on the ground floor speakers start to be unloaded from a white van and another rig is assembled. This is raving stripped down to its most basic elements: big soundsystems, minimal lighting, no searches at the door, no ID checks, no fixed set times, no closing time, and no maximum capacity. Instead of expensive drinks, cans of beer and balloons of nitrous oxide, pumped straight from a large blue cylinder, are being sold for two pounds each at a makeshift bar. Instead of bouncers, squat dogs trot about, winding their way through people’s legs. Instead of toilets, traffic cones have been wedged upside down into holes in the concrete floor in an area next to the bar that has been partitioned off with a shoulder-high piece of wooden fence. Above the cones '"Ladies Toilets” has been scrawled on the wall in spray paint. Despite the intentions of the Metropolitan Police, 2018 has been studded by scores of anarchic parties like this in London – from low key events, discreetly tucked away in dilapidated industrial estates to outdoor raves in the city’s rural nooks. There have also been audacious building hijackings, like when rave crews took over the abandoned Coronet Theatre in late January, putting on a party for hundreds of people as police vehicles lined the roads outside. Nearly all of these parties have gone off without any problems, but not every hastily arranged rave in an abandoned building ends well. The lack of security at some illegal parties makes them vulnerable to gangs that are willing to use violence to make fast money, and parties can be marred by tragic deaths from drug overdoses. Last Halloween two people were shot when gunmen wearing masks let off semi-automatic weapons at an illegal party in Leyton, and over the course of 2014 two teenage boys died after taking drugs at separate unlicensed raves in London. The Met says incidents like these justify its ongoing crackdown, but free party crews argue there are just as many issues with drugs and violence at licensed music events, and heavy-handed police tactics often cause more problems than they solve. 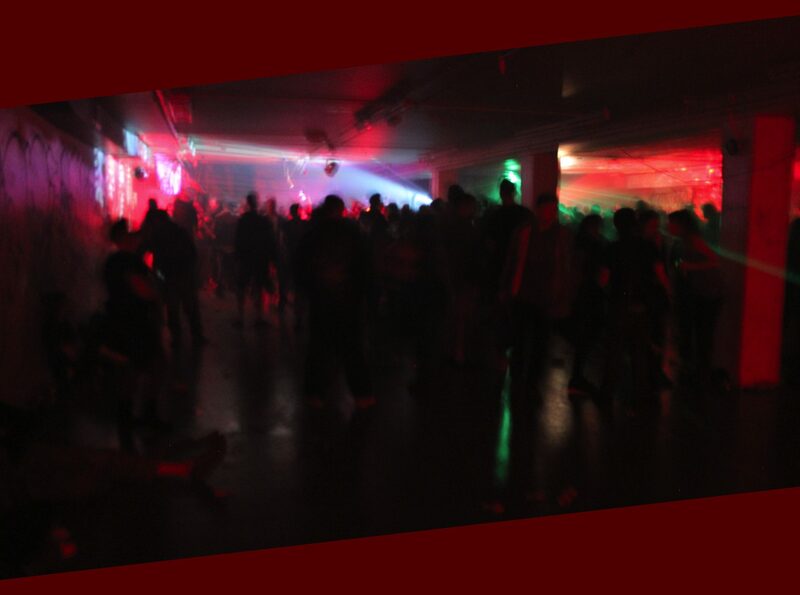 In November 2015, when the Met first started to harden its stance against squat parties, one instalment of the notorious Scumoween raves resulted in pitched battles between partygoers and police officers in Lambeth. A total of 26 officers and a police dog were hurt in the clashes and 54 people were arrested. Afterwards, both the free party crews and the police blamed each other for the rioting, with ravers saying the police were too aggressive and unwilling to negotiate a resolution. The police complained of being attacked and taunted by the crowd. The investigation into the 2015 Scumoween cost the Met more than half a million pounds, according to information provided to Mixmag under freedom of information laws. Those behind some of the more brazen illegal parties say the police effort to clampdown on London’s rave renaissance is a futile waste of public resources. “The police may say they are conducting 'intelligence-led operations' - but the truth is they really don’t have a clue what they are dealing with,” says a member of one of the most active London free party crews, who asked to be referred to as Dave, though this is not his real name. “One of the big mistakes the police make is that they always want to know who ‘the organiser’ is. Dave says his crew doesn’t charge people to get into parties unless they are collecting funds for a cause. 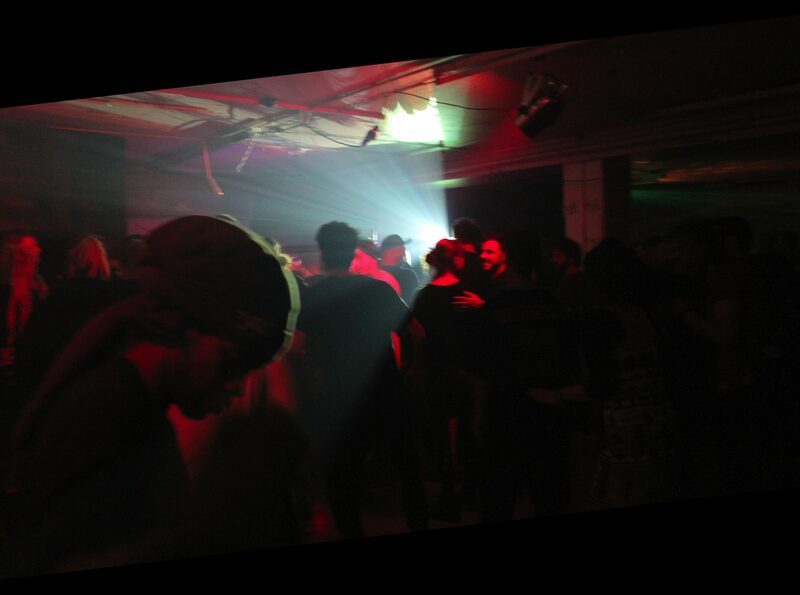 On the night of the party in the Hackney office block money is being raised for the Brufut Education Project, a scheme to provide education to children in Gambia that has been supported by several rigs in the London freeparty scene since 2010. “We’re not trying to make money,” says Dave. The world of legitimate clubbing and promotion has been turned on its head by the rise of social media, with marketing teams doing everything possible to generate viral advertising campaigns and “Instagenic” moments. But in the free party scene, much has remained the same since the late eighties, when the likes of Carl Cox and Paul Oakenfold were making a name for themselves at rural raves on the outskirts of London. 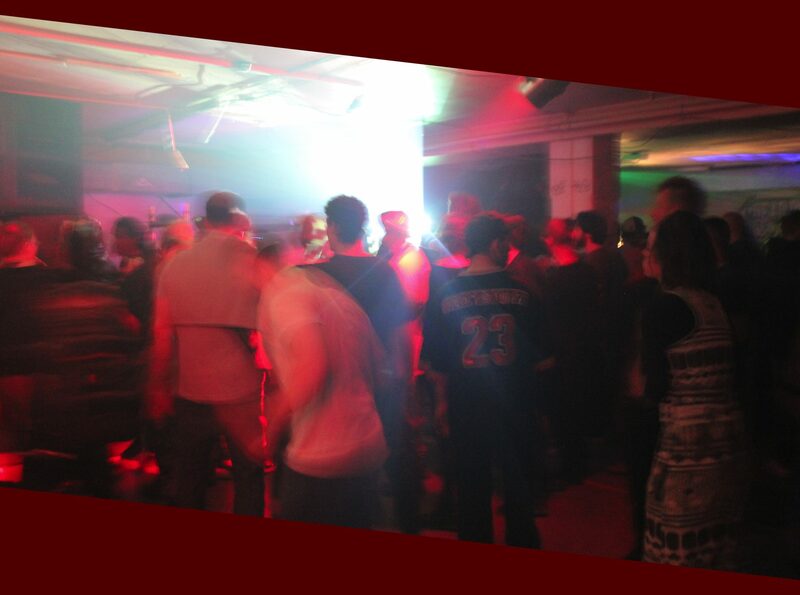 Most illegal parties still use the last-minute release of the location via a voicemail message as a tactic to try and stop the police from shutting the party down in its early stages – allowing the rave to reach a size where the police risk prompting a riot if they try to shut it down. “Promoters at Printworks or Fabric want the maximum number of people seeing details of their party on Facebook and Instagram,” says a member of one crew. Part of the reason that London is seeing surging demand for illegal parties is down to simple economics, according to the free party veteran and acid techno innovator Chris Liberator. "Working people can’t buy homes. They've got no foothold in any part of London’s environment whatsoever - and very little cultural representation." Chris, who released the tongue-in-cheek squat party anthem One Night In Hackney in collaboration with Dave The Drummer in 2004, says illegal parties can be seen as a way for people to take back part of the city and make it their own - even if it is just for one night. "Cultural expression does not work within a strict set of rules. At most big clubs now you have to jump through hoops to get in. At some you literally have to bring your passport. "There are people in their fifties who have been raving for 30 years and they don’t want to be literally humiliated when they go out. "This is not the Handmaid’s Tale or some dystopian future. This is a normal London night out. We shouldn’t have to go through all this kind of stuff. "I’m not saying that there shouldn’t be health and safety rules. I’m just saying what people feel and a lot of people do not want to play, all the time, by a set of rules that pretty much take the fun out of everything." As the rave spirals into the early morning the pounding techno in the basement disintegrates into a scattering of broken beats and synth lines as the French breakcore DJ Stazma The Junglechrist opens his set with the track Fluent from his ‘Fluorhydrique’ EP, which is set to be released on the Houston-based label Defunkt Records. Gradually, Stazma drags the rave into a new dark and chaotic phase, ushering in a chopped-up, reconfigured sprawl of drum patterns and juddering bass sounds. Upstairs, on the ground floor, a different kind of chaos is unfolding as a mishmash of jazz and Afrobeat oddities are played out. The psychedelic '70s Soviet jazz of Aleksandr Zatsepin smoothly slides into the disco flute riffing of Jimi Tenor and funk drumming of Tony Allen, which in turn transitions into ‘Juan Pablo’ by South London’s new age jazz pioneers Ezra Collective. The growing strength and diversity of London’s illegal rave scene is partly being driven by higher costs and stricter rules at mainstream clubs, according to Tommy, a member of the collective Broken Note. “London is becoming less and less available for any promoters to do anything,” he says. Broken Note’s sound is a relentlessly heavy mishmash of dubstep, drum ‘n’ bass, techno, metal, and punk rock. It was originally forged in the squat parties of Hackney Wick 13 years ago and its members have witnessed London’s free party scene fluctuate over the years. “When we first came into the scene there was a lot of techno guys around like Dave The Drummer and Chris Liberator,” he says. Over the last few years Broken Note has taken its sound to clubs and festivals in the US, South America, Australia, Japan and Thailand. “We’ve played all over the world at this point, but I feel that the core of what keeps us on track is remembering why we do it and how we started,” says Tommy. “It’s never been about making money. We always try to go into the studio with the same mentality as if we are taking a rig into a warehouse." Manchester-based DJ and producer Gore Tech manages the label Exe Project and says it’s the unpredictability that keeps him coming back to the London freeparty scene, despite the risk of police raids and occasional loss of equipment. “I know lifelong ravers that have been completely put off the scene after a single night when it all goes wrong,” he says. “It can be terrifying – people running everywhere and police sending in dogs. “But I still find it exciting to breathe life into these huge structures that are otherwise abandoned. “In a club often everything sounds great and the DJ will usually walk away happy with the engineering, but when you are in a building that isn’t actually designed for music you get some incredible, unexpected effects,” he says. As pale morning light drifts though the windows on the ground floor, the jazz DJ is replaced by Oliotronix, a female Estonian DJ-producer dressed in NASA overalls with her entire face painted bright blue who proceeds to bombard the room with pounding 8-bit techno via a bastardised Gameboy with enhanced bass and a 3.5mm line out socket soldered into it. Speaking after the party, Stazma says London’s illegal parties often give opportunities to uncompromising producers and DJs that are deemed uncommercial by licensed nightclubs and venues. “The spirit at these parties is unique,” he says. “What I like about the English guys, especially the free party crews in London, is that they come to rave hard to super weird music. 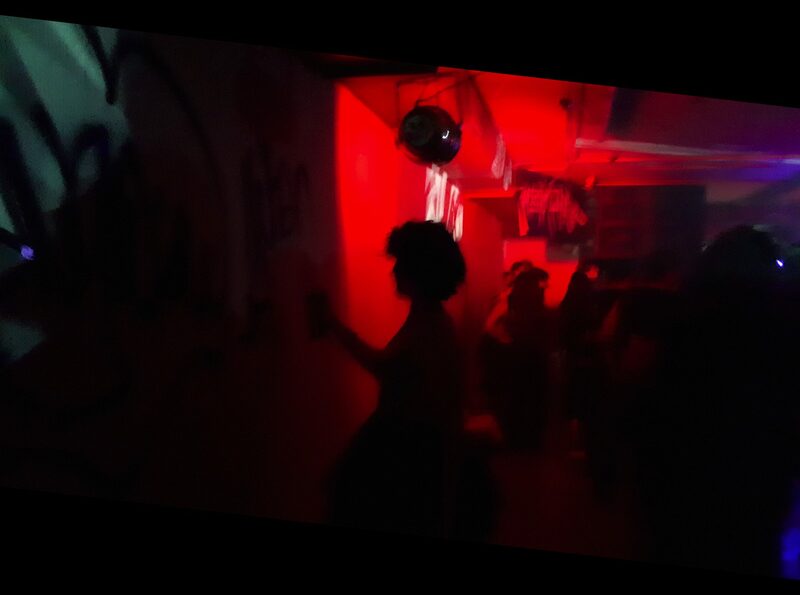 “There is a freedom you rarely experience in London’s legitimate clubs,” she says. “You’ve got this huge diverse audience - all harmoniously working together - bringing their art, bringing their sound system, their time, their skills, their effort. When the police arrive, at around 9am, dozens of ravers are lounging around in the car park in the morning sun. While the officers negotiate with a small group at the gate they are generally ignored by the huddled groups of smokers and drinkers that fill the yard – some sitting on battered armchairs that have been fished out of a nearby skip. After around 40-minutes at the gates the police drive away. It seems like a deal has been brokered and the, now very hot and sweaty, party in the basement is free to carry on without interruption. Outside, conversations range wildly from deranged nonsense, to discussions on the pros and cons of playing jazz at a squat rave, to reminiscences about other parties – an oral history of the anarchic underbelly of the UK’s electronic music scene. Castlemorton Common. Reclaim The Streets. Keith from Desert Storm. “Rigs come and go, but the free party scene is doing ok,” mulls one squatter as he sits in the sunshine, patting Zeus, a sociable Staffordshire Bull Terrier cross.